IDF investigates video allegedly filmed last weekend documenting sniper activity aimed at Gaza border demonstrators. The IDF is reviewing the authenticity of a video allegedly documenting an Israeli sniper shooting at a demonstrator during clashes between IDF forces and Hamas marchers on the Gaza border last weekend. In the video, the demonstrators are seen through the sniper's gun sight, and a conversation with his friends is audible. This afternoon, France condemned Israel's efforts to stop the riots on its border. "France again condemns the indiscriminate firing of the Israeli army. Light must be shed on these incidents," the French Foreign Ministry said in a statement. 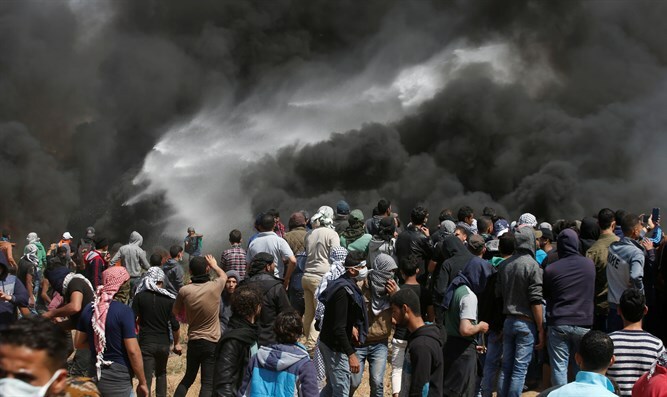 The Russian Foreign Ministry claimed that "the Israeli use of military force on the Gaza border against a civilian population is unacceptable." Yesterday, Operations Branch Doctrine and Training Division head Brig. Gen. Moti Baruchin was appointed head of the General Staff's debriefing mechanism for the recent events in the fence area. MK Oren Hazan responded in a tweet to the controversy generated by the film's release: "What's the fuss about? The message was given in advance: Anyone approaching the fence - armed or not - is going to get it. And that's a good thing! "Then let the soldiers defend us all - I, personally, am proud of them! "I hope that through the video clip the other side'll get the message clearer," Hazan tweeted.